LEGO CUUSOO had a busy day, with a new model reaching 10,000 votes and one being rejected. First, the Shaun of the Dead Winchester MOC that reached 10,000 last month has been officially turned down by LEGO. It’s a great model, but LEGO ultimately decided that a violent, R-rated movie wasn’t appropriate for its target market. You can read the press release here. Nevertheless, LEGO was very complimentary towards Greg, the model’s designer, praising his dedication and constructive attitude. Hopefully he’ll be back with a great new model in the future! Second, this EVE Online Rifter has reached the 10,000 votes needed to enter production. Unfortunately, it’s just not very well done. My eyes hurt just looking at all those studs! Hopefully LEGO will rebuild the model in a sleeker design, as their comments might suggest. At least, as LEGO points out, they have a history of crafting impressive spaceships. Once again, CUUSOO has been discovered by the Internet, where MMORPG games, zombie movies, and Minecraft are bigger than life. This time, Joystiq and Kotaku featured the MOC, helping to boost the numbers with massive traffic. I’m still skeptical that niche licensed themes like this can attract enough customers to make CUUSOO profitable for LEGO. Only time will tell, but I hope the success stories aren’t limited to video games. 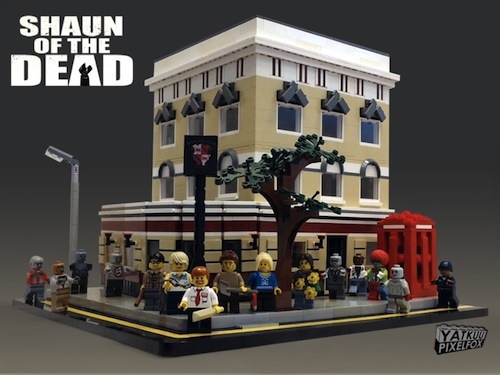 An official Shaun of the Dead LEGO? Yatkuu‘s CUUSOO rendition of the Winchester Pub has reached the necessary 10,000 votes after it was mentioned by Shaun of the Dead star Simon Pegg during his appearance on Conan O’Brien’s TBS show. It’s a fantastic model, complete with everything necessary to recreate the zombie apocalypse, but I can’t see LEGO actually producing this. R-rated violent films aren’t exactly LEGO’s wheelhouse, and the company is very protective of its child-friendly image. 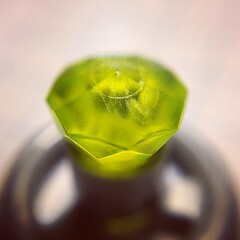 Besides, much like Minecraft Micro World, this might not have a broad enough appeal to be a successful product. LEGO seems to be experiencing the power of internet fads, where a niche product gains thousands of supporters overnight and is then forgotten by the vast majority. Perhaps because of this, LEGO has introduced an approval process to CUUSOO that will screen for plagiarized or objectionable sets much like Apple does in the App Store. While there are solid arguments for and against app store censorship, I can’t imagine much pushback for LEGO’s new policy. There are far too many duplicates and low-quality projects on CUUSOO, and this should address the problem. Regardless of whether LEGO actually produces the Winchester, I encourage you to check out the set in more detail. 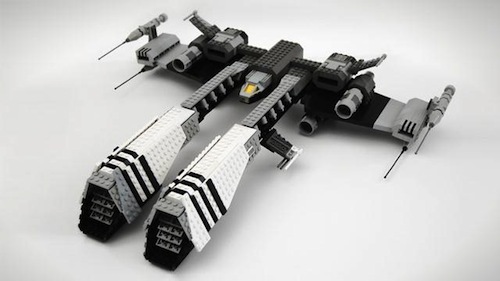 This is a first-class MOC that earned much respect from the AFOL community long before Conan shared it with the world. Congratulations to Yatkuu for such a creative model and the support thrown behind his ideas!